(Photo: REUTERS / Yuri Gripas)Pro-life activists rally in front of U.S. Supreme Court in Washington June 25, 2012. Opinions on the morality of abortions differ widely among U.S. Christians but the percentage of Americans who believe it is wrong remains the same, results of a survey conducted by the Pew Research Center show. "Regardless of their views about the legality of abortion, most Americans think that having an abortion is a moral issue," Pew said in its report. 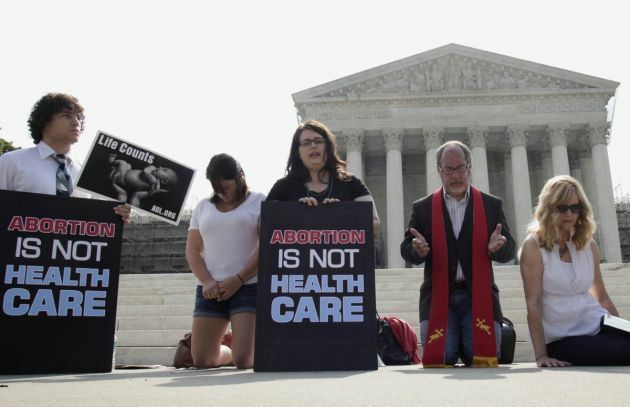 Released on August 15, the study indicated that fully three-quarters of white evangelical Protestants consider having an abortion morally wrong, as do about two-thirds of Hispanic Catholics (64 percent). A majority of black Protestants (58 percent) and about half of white Catholics (53 percent) say the same. The survey also revealed that fewer white mainline Protestants (38 percent) and religiously unaffiliated adults (25 percent) believe that abortion is morally wrong. The survey found that those who attend religious services at least once a week are much more inclined to say that having an abortion is morally wrong than those who seldom or never attend (70 percent against 32 percent). This pattern holds steady across religious groups. Overall, 49 percent of Americans hold the view that abortion is morally unacceptable. Pew also asked those surveyed about the morality of embryonic stem cell research and in vitro fertilization, a procedure in which a woman's eggs are fertilized in a laboratory and transferred to her uterus. U.S. Christians were more accepting of both procedures. For example, the number of white evangelical respondents who said they believe embryonic stem cell research is morally wrong dropped to 38 percent. Furthermore, the number of white evangelicals who believe that in vitro fertilization is morally wrong plummeted to 13 percent. All the adult Americans surveyed had almost the same view on in vitro fertilization, while being less concerned than white evangelicals about embryonic stem cell research. Janet Parshall, an evangelical radio host on the Moody Broadcast Network, was quoted in the Christian Post as saying she sees a shift in American attitudes on abortion. "While currently Americans collectively lack clarity on more sophisticated human life issues like IVF and embryonic stem cell research, we are moving toward a position of moral certitude on the issue of abortion," she said. "This is a crucial point in history where clear voices of dissent must be heard in defense of those little voices we cannot yet hear. The wind is at our back and truth fills our sails." Michael New, a Michigan professor of political science whose research has focused on legislation restricting, blogged in Life Site News that the survey results show that the efforts of pro-lifers have paid off. "The fact that pro-lifers have convinced many Americans that abortion is immoral has quietly paid some real dividends. "For instance, few doctors are willing to perform abortions and supporters of legal abortion have had to make large investments to train the next generation of abortion practitioners." The survey was conducted by Pew's Religion and Public Life Project. Pew's report is based on telephone interviews conducted between March 21 and April 8, 2013. Researchers interviewed 4,006 adults by telephone. Respondents were 18 years of age or older and lived in all 50 U.S. states and the District of Columbia. Interviews were completed in English and Spanish. Those called were asked if they believed that abortion, embryonic and non-embryonic stem cell research, and in vitro fertilization was morally wrong, not a moral issue, or morally acceptable. Overall, only 15 percent of Americans now deem abortion as morally acceptable.